The very famous Sri Lankan cuisine dates back with the influence of colonists and foreign traders that came to the country many years ago. Their cuisine mostly consists of rice which is their staple food and meals that are full of spices and other tasty ingredients. Rice and curry are the well known dish for a regular meal. Rice being the staple diet, locals consume it daily, and most often, at all three meal times and both the red and white varieties are popular. Sri Lankans serve their rice with fish or meat -based dishes and other kinds of vegetable curries. There is also a famous dish known as “mallung” which are chopped leaves cooked with grated coconut meat and red onions. For special occasions, especially religious occasions, rice is boiled in thick coconut milk to make a creamy textured rice pudding called ‘kiri-bath’ of soothing delectable flavour. Sri Lankan’s spicy curries are generally consumed with the staple rice or with other bases such as ‘Hoppers’, ‘Roti’, ‘Pittu’ and ‘String Hoppers’. Meats, fish, vegetables and even eggs are prepared with local spices and coconut cream. Onions, green chillies, black pepper, cardamom, cloves, cinnamon, saffron, garlic, ginger, curry leaves, herbs and nutmeg are provides the different flavours and aromas. A complete rice and curry meal, which includes a meat or fish curry, two or three different vegetable curries, dhal curry, and a ‘mallum’ made of chopped leaves and coconut, makes the most scrumptious course. ‘Hoppers’, a variant of pancakes, is made out of a batter of rice flour fermented in palm toddy. Cooked in the round cast-iron pan, this concave pancake has the most amazing toddy flavoured fluffy centre and a golden brown crisp border. ‘String hoppers’, is made of rice flour and is the easiest substitute for rice. 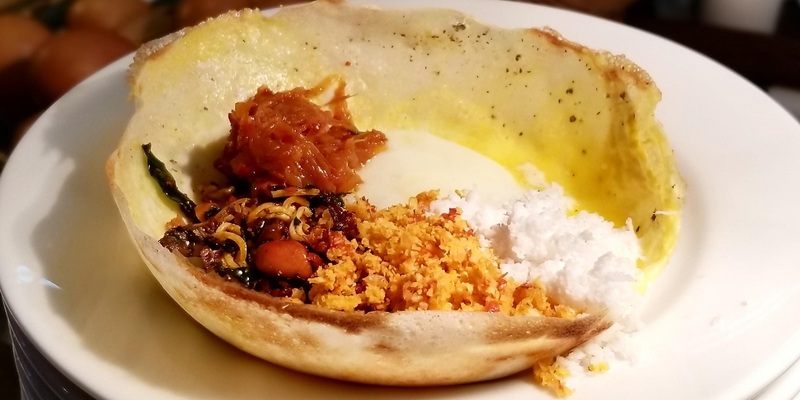 A dough made of rice flour and water cast through a string mould is steamed on little wicker mats to create this light lacy meal which goes well with dhal curry, a local meat curry and the ever versatile Pol Sambol. Pittu is made by steaming a mixture of grated coconut and rice flour in a bamboo mould. The steamy, soft, crumbly Pittu has the most enticing aroma and is best eaten with fresh coconut milk, lunu-miris and local meat curry. Thosai is made of a batter out of fermented lentil flavoured with local spices, which is then cooked on a hot griddle. Thosai is most often eaten with a mixed vegetable curry accompanied by a green-chilli and coconut sambal. Kottu, is a mix of vegetables and any other foodstuff of choice chopped heartily together with a thin roti. There are Fish, Beef, Chicken, Mutton and Cheese Kottu, but there is no hard and fast rule as to how you want to have the mix. 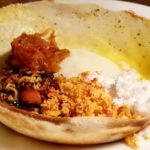 Lampreis, the diva of Sri Lankan rice and curry is a dish of rice cooked in stock, combined with a variety of mouth-watering local curries. There is also the sort of meal the Sri Lankan called the “short eats” which a variety of snacks that can be found in restaurants and fast food chains along Sri Lanka. This includes Chinese rolls, patties, fish cutlets and others. There are so many other Sri Lankan meals that are truly delectable and mouth-watering that everyone will surely love to try. Everyone is free to try out some of the best Sri Lankan cuisine once they come to the country and have a taste of a true Sri Lankan living. One will be very satisfied with what they can try here is Sri Lanka.